Builder: Cammell Laird Shipbuilders, Birkenhead, U.K.
HMS Campbeltown was a Batch 3 Type 22 frigate of the British Royal Navy. Built by Cammell Laird Shipbuilders Ltd. in Birkenhead, she was part of the third batch of Type 22s, which were considerably larger than their predecessors and incorporated more advanced weaponry after lessons learnt from the Falklands War. She was decommissioned on 7 April 2011. 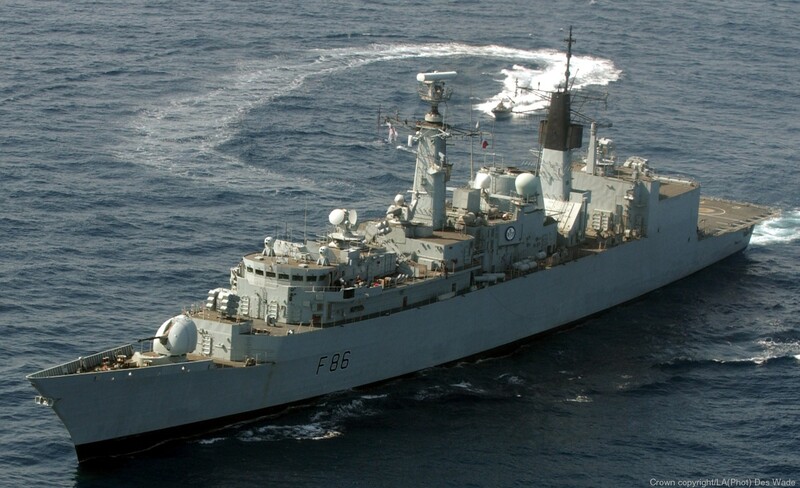 Campbeltown's last deployment was a seven-month tour from 2007-2008 in the Persian Gulf, where she operated in support of Operation Calash and Operation Telic. In early 2004 the vessel was deployed as part of NATO's Standing Naval Force Atlantic. 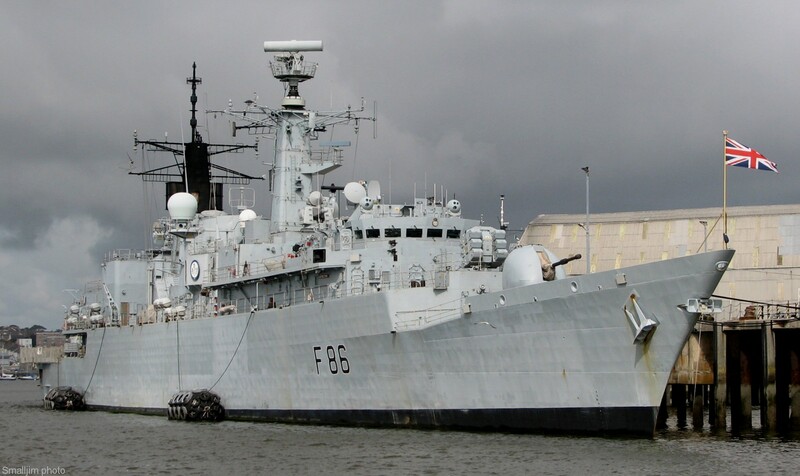 HMS Campbeltown entered refit in September 2008. The ship's bell of the first HMS Campbeltown, a Second World War Town-class destroyer famous for her role in the St. Nazaire Raid, has been loaned from Campbelltown, Pennsylvania to the current Campbeltown for the duration of her Royal Navy service. 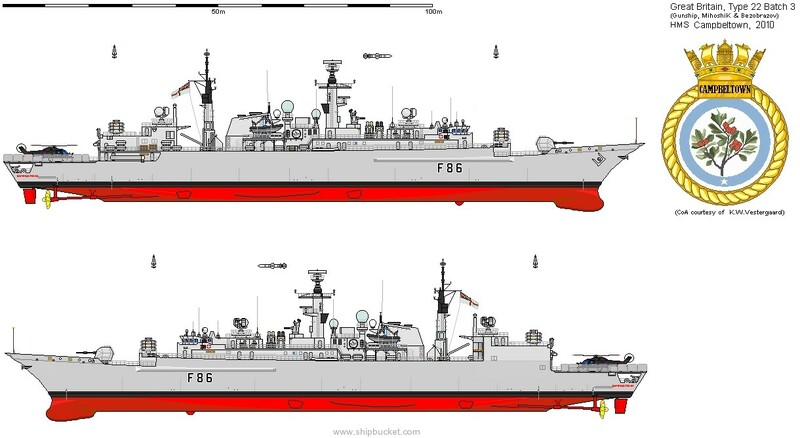 The Royal Navy announced in March 2011 that Campbeltown would be decommissioned on 7 April 2011. She paid a final visit to her namesake town of Campbeltown, Argyll in March 2011 where a series of ceremonies, including a town centre parade by the ship's crew, took place to commemorate the end of the ship's active service. Campbeltown made her final entrance to Plymouth on 31 March 2011 before decommissioning in a traditional ceremony on 7 April 2011. She was laid up at Portsmouth and in July 2013 sold to Turkish company Leyal for demolition. She was towed to Turkey in Autumn 2013. The ship's bell has now been returned to Campbelltown, Pennsylvania. The ship's bell made specifically for the latest HMS Campbeltown was given to Campbeltown, Kintyre, to be displayed in the town's museum until a future Campbeltown is commissioned.